FOX’s schedule for the 2010-11 season will look a lot like the current season, primarily because the network doesn’t have too many holes to fill. There will be three new dramas and four sitcoms. 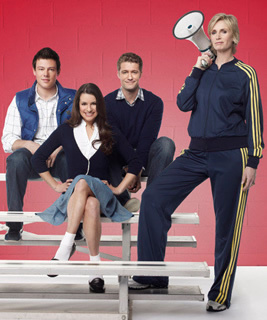 Glee will get the plum position behind the Super Bowl next year. That’s a very nice vote of confidence for the TV show but you have to wonder how many football fans are watching the musical series. It’s sure to help ratings though. While Glee is a success in many ways, it’s not a blockbuster hit that many believe it is. The Idol results show will supposedly be shaved to a half hour. Before you get too excited, keep in mind that FOX has said that in the past. It was presumed that Simon Cowell’s new series would kick off this fall but it’s not on the schedule. It’s interesting that Human Target’s been put on Friday nights, a little-watched night for television. It remains to be seen how many viewers the show will have to attract to be considered a success. If any of your favorites are missing, be sure to check out our list of FOX cancelled and renewed shows. What do you think? Any thoughts on the new schedule? Like or dislike any choices? I’m going to miss The Good Guys on Fridays… please tell me they will be back. My friends and I LOVE this show! One of the best new shows I have found. @Mary Sagor: First, only households that are part of the Nielsen service are actually counted in the ratings. DVR recordings are counted if the show is actually watched. @charlene yeakel: If you’re talking about the Christian Slater series, it didn’t get picked up. Totally bummed about Flash Forward . wish Human Target would have moved to Monday night to take the spot vacated by 24. I certainly miss not seeing 24 on the Monday lineup…that show has become a staple in my Monday evening viewing. I was kinda hoping Fringe would move back to Tuesdays. But also kinda glad they left it on the same night. I think its the best show on television and didn’t want to see Fox moving all around where people can’t find it anymore.